17 December 2018 - Alarming changes in nature and our environment are all around us: forests and wildlife are disappearing; air and oceans are increasingly polluted; sea levels are rising, and the frequency of extreme weather phenomena is increasing. The new collaboration ‘Cultural and Artistic Responses to Environmental Change’ from Goethe-Institut and the Prince Claus Fund, initiated in August 2018 seeks to support artistic and cultural initiatives that engage local communities as well as global institutions in finding solutions to these challenges. For the first application round, a committee selected 15 projects from 350 applications in December 2018 for an grant amount of up to 15,000 Euro to develop and realise their projects within the next year. Johannes Ebert, General Secretary of the Goethe-Institut stated: “The Prince Claus Fund is an important cultural institution. In many countries we share the same objectives and support similar projects. So it was about time that our two institutions work closely together on a broader scale in order to support international projects in the field of cultural engagement for ecology. Because the ecological future of the planet is one of the most important challenges of our time. The Goethe-Institut and its partners around the world have a long-standing history of engaging with projects that deal with both contemporary art and culture as well as the environment. This will definitely be one of our focus themes in the coming years. The number and the quality of proposals proof that the cooperation with the Prince Claus Fund is a great success of European and international collaboration." The 15 projects supported of the 350 applications from Africa, Latin America, Asia, the Caribbean and Eastern Europe were selected by a committee from both institutions. The committee focused on out-of-the-box initiatives by artists and cultural practitioners looking to re-imagine conventional approaches to environmental sustainability, reinforce and rethink traditional knowledge and methods as a means to promote sustainability and promote the vital role that arts and culture play in mobilizing communities to raise awareness. “The creative ideas of cultural practitioners of all kinds can engage people in the struggle to protect our environment in ways that nothing else can. These projects can make a real difference!” – Joumana El Zein Khoury, Director of the Prince Claus Fund, commented on the selection. The supported initiatives are well-established locally. They draw attention to sustainable alternatives from an artistic perspective and support the worldwide exchange of new ideas. More than half of the projects are led by women. They range from a collaboration between sound artists, scholars, activists and general public to address the transformation of the Karachi waterfront due to privatization of public beaches and erosion of oceanic and costal ecologies (Karachi Beach Radio by Yaminay Nasir Chaudhri and Julia Tieke), to an exploration of the history of coca leaves’ usage by the Colombian indigenous communities through an audio-visual archive of the cultural and spiritual aspects of the plant (Coca Files by 4Direcciones Audio-Visual), to combining arts and technology in order to save the coral reefs with help of submerged kinetic devices related symbiotically with the reef itself (KORA-LLYSIS by Gilberto Esparza). About the Prince Claus Fund - The Prince Claus Fund has a track record of over 20 years of excellence in supporting cultural and artistic initiatives in the most challenging spaces. The Fund has been a successful actor and liaison in the arts and culture sectors globally, generating possibilities for critical discussion and boosting creative expression. Because of its track record and autonomy, the Fund is seen as a global leader in supporting independent cultural initiatives of the highest quality with a broad social impact. Additionally, our geographical spread has allowed us to accrue an invaluable, extensive network of local contacts – artists, cultural practitioners, institutions and experts. About the Goethe Institut - The Goethe-Institut is the cultural institute of the Federal Republic of Germany with a global reach. With our network of 159 institutes around the world we promote knowledge of the German language abroad and foster international cultural cooperation. We convey a comprehensive image of Germany by providing information about cultural, social and political life in our nation. Our cultural and educational programmes encourage intercultural dialogue and enable cultural involvement. They strengthen the development of structures in civil society and foster worldwide mobility. 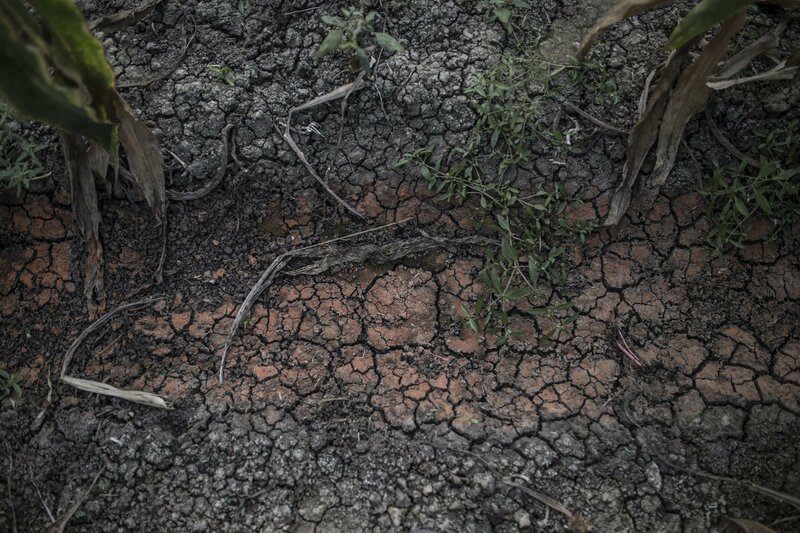 Photo Credits: Ahmed Gaber, We, the Living Dead, 2018 - Cracks appear as traces of drought on land in Al-Buhaira – using underground water rich in salts harms the lands.